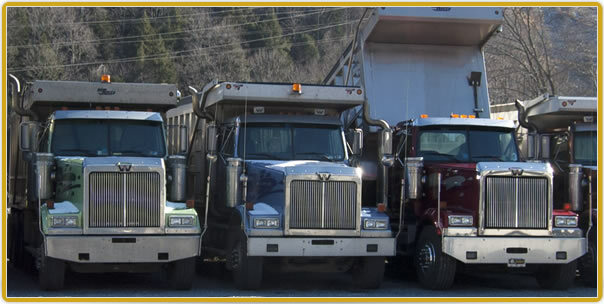 Johnstown Pennsylvania Trucking & Truck Repair: Homer R. Sleek & Sons, Inc. "Sleek Trucking"
Our bulk services are for those customers interested in a tri-axle load/s delivered to a specific location. A tri-axle load of stone will range between 22-25 tons per load. We are able to deliver partial loads, if necessary. Our capabilities extend from single load delivery to very large quantities. Tailgating is possible depending on the aggregate and site location. Our team of dedicated mechanics has a combined experience of 52 years. Our shop is fully equipped to handle heavy and light duty car and truck diagnostics as well as trailer repairs. In addition, we are a Pennsylvania State Inspection Station with Emission Testing. Contact us today to determine the cost of our products and the quantity of material needed. Providing safe, dependable, service is a tradition that began at Sleek Trucking nearly 75 years ago and remains our focus today. Not sure what material best suits your application or how much? Contact us, we are available to answer your questions and deliver a quality product. Individual, competent service at competitive prices is only a telephone call away.